Ronnie McFall has launched a spirited defence of his backline in the aftermath of Saturday’s 5-5 draw with Ballymena United. The Ports held the upper hand across the majority of the frantic Danske Bank Premiership draw but a collapse over the closing minutes cost McFall’s men victory. Post-match frustration centred on the home side’s inability to protect a two-goal lead with less than 10 minutes left to play. 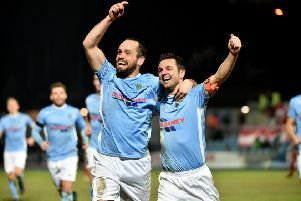 However, McFall - the Ports boss - has backed his players to regroup and produce the perfect response. Portadown struggled against Ballymena to deal with high balls into the box and tonight’s (Friday’s) visit to league leaders Crusaders is expected to serve up an increased aerial threat. “There is no doubt the defenders we have are good enough for this level,” said McFall. “This squad has displayed character in the past to recover from setbacks and the players have been able to prove the quality at this club. “Overall, it is still a young back four so we must live with the faults but they will grow with experience and develop together thanks to a willingness to learn. “We cannot dwell on the past and must put Saturday behind us then look to the Crusaders match. “Remember, last time we played Crusaders both Garry Breen and Chris Ramsey looked outstanding as a centre-back pairing. Chris Casement signed a midweek long-term extension to his contract leading up to Saturday but suffered medial ligament damage in the first half against Ballymena. “I thought the tackle was a straight red card,” said McFall. “He is going to be out for between four to six weeks and Garry is also due for a knee scan to identify the issue with an injury dating back now a few weeks. “Keith O’Hara is still out and currently taking part in rehab to help his hip injury. “One positive from Saturday was our outstanding attacking play, with the movement and intensity superb across the side. Kick-off tonight (Friday) at Seaview will be 7.45 in the Danske Bank Premiership.